The first natriuretic peptide to be identified was atrial natriuretic peptide (ANP), which was originally called atrial natriuretic factor (ANF) because of its unknown structure. It was discovered by de Bold and co-workers in 1981. They found that intravenous infusion of atrial, but not ventricular, homogenates into rats caused a rapid and dramatic increase in renal sodium and water excretion that was accompanied by reduced blood pressure. Subsequently, a smooth muscle relaxing activity was shown to cofractionate with the natriuretic activity. 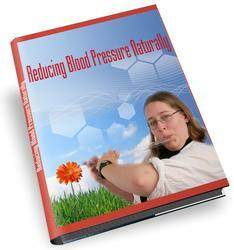 The peptide responsible for both blood pressure lowering properties was purified and sequenced from multiple species by several laboratories. The structure of the polypeptide precursor of the mature peptide was derived from cDNA sequence, which like the peptide sequence was obtained from a number of different species by several different laboratories. All natriuretic peptides are synthesized as preprohor-mones. Human preproANP is 151 amino acids in length. Proteolytic removal of the amino-terminal signal sequence yields a 126 residue proANP peptide, which is the predominant storage form found in dense atrial granules. Upon secretion, proANP is cleaved by corin, a transmembrane serine protease, to a 98 residue amino-terminal peptide and a 28 residue carboxyl-terminal peptide. Both fragments circulate in the plasma and are elevated under conditions where vascular volume is increased, such as congestive heart failure. The carboxyl terminal 28 amino-acid peptide is the mature biologically active form of ANP that mediates the known biological effects associated with the ANP gene (Figure 1). The majority of ANP gene expression occurs in the cardiac atria, but there is low-level expression in extra-atrial tissues, e.g., central nervous system, adrenal gland, kidney, and ventricles. Expression in the latter tissue is generally only observed in early life or during ventricular hypertrophy. Hence, ANP mRNA expression has become a universal marker for ventricular remodeling that results from prolonged hypertension or other forms of cardiovascular insult. Differential processing of ANP in the kidney produces a variant containing four additional amino-terminal amino acids called urodila-tin. It has been reported to be more potent than ANP, possibly because it is less sensitive to proteolytic degradation by neutral endopeptidases (NEPs). Atrial-wall stretch, reflecting increased intravascular volume, is the dominant stimulus for ANP release. However, several hormones and neurotransmitters - such as endothelin, arginine vasopressin, and catecholamines -also stimulate its secretion. In addition to stimulating natriuresis, diuresis, and vasorelaxation, ANP also inhibits renin, vasopressin, and aldosterone release. 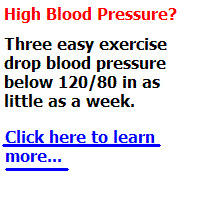 It decreases cell proliferation and hypertrophy as well. Hence, ANP's short-term (natriuresis, diuresis, vasorelaxation) and long-term (antimitogenesis) effects are generally considered beneficial. FIGURE 1 Schematic representation of natriuretic peptides and their receptors. 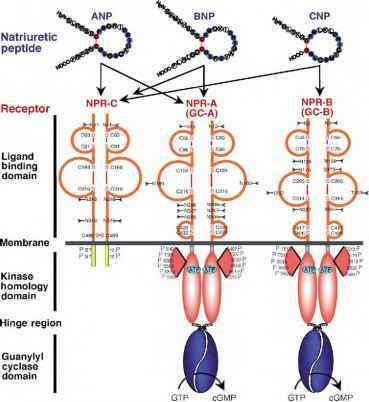 Black arrows indicate which receptors each natriuretic peptide binds. Note that each peptide can bind more than one receptor. Blue circles in natriuretic peptide structures indicate conserved residues. Red lines indicate disulfide bonds. Black branched lines indicate N-linked glycosylation sites. Blue Ps indicate phosphorylation sites. ANP, atrial natriuretic peptide; BNP, brain natriuretic peptide; CNP, C-type natriuretic peptide; cGMP, cyclic guanosine monophosphate; GC-A, guanylyl cyclase A; GC-B, guanylyl cyclase B; GTP, guanosine triphosphate; NPR-A, natriuretic peptide receptor A; NPR-B, natriuretic peptide receptor B; NPR-C, natriuretic peptide receptor C.
salt diet (0.008% NaCl), consistent with ANP mediating its effects independently of body sodium chloride levels. ANP is degraded outside and inside the cell by extracellular proteases and NPR-C-dependent internali-zation and degradation, respectively. The extracellular NEP 24.11 is a metallopeptidase that degrades all three natriuretic peptides. Recently, compounds have been developed that inhibit both angiotensin converting enzyme (ACE) and NEP. Omapatrilat, the most studied of these so-called vasopeptidase inhibitors, has the combined benefit of prolonging the blood pressure decreasing effects of natriuretic peptides while inhibiting the blood pressure increasing effects of the angiotensin system. Although early indications from clinical trials suggested that these drugs are beneficial to some patients with hypertension and/or congestive heart failure, very recent studies indicate that patients receiving vasopeptidase inhibitors experience more angioedema than patients treated with ACE inhibitors. Therefore, further development is needed before vasopeptidase inhibitors are viable alternatives to current therapies.